A serendipitous happenstance, as my mother used to say. On the one hand, I just returned from a short visit to Paris (hence my absence last week), and was looking for a French connection Song of The Week, having quite a hard time of it. It says a lot about my lack of appreciation for le scene that I couldn’t think of a single piece more recent than Eric Satie that speaks to me (with the glaring exception of James Taylor’s lovely tune ‘Chanson Française’, which probably doesn’t count). And on the other hand, I got a lot of flack about SoTW 19, the free jazz bass player playing with Mal Waldron, sounding like chickens being beheaded right there in the studio. And I feel very bad about that, not for the chickens, not even for the bassist, but because I didn’t give Mal Waldron his proper respect. So, a confluence of interests–I’ve been listening to Mal Waldron and Steve Lacy’s 4-CD “Live at Dreher, Paris 1981” on the hatology label for years now, and every single time, it’s a trip. I raised the subject of ‘free jazz’ in the previous mailing, and I’d like to try to present a bit of a defense of it here, if you’ll bear with me. I know it’s an uphill fight, because normal people aren’t predisposed to subject themselves to music which is a priori painful to the ears. But really, it’s not that simple. What are we talking about? It’s music that’s highly improvisational, usually starting from a pre-composed theme and then typically flying off into extreme improvisation. It’s often hard on the ear, aggressive, non-melodic, even atonal. So what’s the attraction? There are times when ‘nice’ just doesn’t do it. When you feel you need a challenge, something larger and more weighty to wrap your mind around. Not necessarily ponderous or profound or pompous or pompommed (sorry for that last one). Something with grit and gristle. I’m hoping you’ll have the courage and patience to give our Song of The Week a good listen. It’s 15 minutes long, and it’s definitely not background music for riding an elevator or shopping for groceries or talking to your mother-in-law on the phone. Know what? If you’re not willing to give it a good, serious listen, don’t even turn it on, because it’ll just annoy you. But I do urge you to try it. Learning takes work. I don’t enjoy a lot of what I listen to, but I work at it. What can you do? Listening to music is serious business. This piece is called ‘Snake Out’, written by Waldron. A song is worth a thousand words, even if it’s 15 minutes long. It needs space to, if you’ll pardon the eponymousness, ‘snake out’. This week’s SoTW does just that. I find it hypnotic, engaging, passionate, dignified. And extremely edifying. Mal Waldron (piano) has worked in a whole range of styles and contexts. In the 1950s he was house pianist and composer for the Prestige label, played in many dozens of sessions (including Coltrane, and in Mingus’s band), and one session entirely of Thelonious Monk compositions led by the soprano saxophonist Steve Lacy in 1958. In the late 50s he accompanied Billie Holiday on stage and in the boudoir till her death. In 1961 he recorded ‘The Quest’ with Eric Dolphy and Ron Carter, an avant-garde classic. He then emigrated to Europe, suffered a breakdown, returned to record prolifically, mostly on small European labels, often in his very personal, dark, brooding, insistently percussive style. I’ve heard one CD of him playing Brahms and Chopin, and even they sound like good old obsessive, depressive Mal. 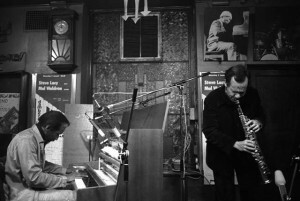 He met up again with Lacy in the 1970s, and over the years they recorded over half a dozen albums together, sometimes as leaders of a hard-bop/avant-garde group, sometimes with Lacy’s very open jazz ensemble, and several times as a duo, which are some of my favorite music, especially this set. 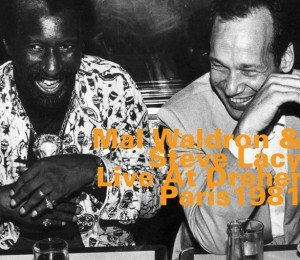 Waldron spent most of his time in Europe till his death in 2002, with some 70 recordings under his name. Steve Lacy was born Steven Norman Lackritz. Not an auspicious name for an entertainer, huh? But from 1957 till his death in 2004 he also recorded some 70 albums, also mostly for small European labels. He’s been the leading proponent of the soprano sax, an instrument for which I hold a very strong predilection. It has a sweet mournful sound, and seems to cause people playing it to go in that direction, even more than flautists are drawn to the flighty and bouncy, or cellists to the thoughtful and poetic. Both Waldron and Lacy have a strong personal voice, and play in contexts ranging from the ‘pretty’ to the horrifying (for the unaccustomed ear). I’ve deliberately chosen a piece from the Dreher set which isn’t too easy, melodic, or accessible. But neither, I think, is it impenetrable or painful to the ears. It’s intense, focused, insistent. Both Waldron and Lacy will grab a phrase, work it and rework it, knead it and probe it and dissect it and squeeze it and exhaust it to a point of catharsis. It’s an arduous trip (like mine to Paris), but enriching. Bon voyage.